In January 2010, three and a half years ago as I write this, EU legislation was brought in that restricted the amount of VOC (volatile organic compounds) that paint could contain. I do not remember much about the build-up to the VOC 2010 compliant paint changes, or hearing how our paints would be affected by the reformulation, in fact I’m not sure how well publicised the new legislation was. But any decorators reading this will remember only too well that oil based paints were hit hard after these changes. Undercoat and wood stain took days to dry, white gloss, satin and eggshell turned yellow in a matter of weeks and soon after we all found out that the new paint tended to fail prematurely when used for exterior painting. Some of the big manufacturers were accused of not testing their products properly before being put on sale. Compensation claims came flooding in from professional tradesmen and DIY enthusiasts alike who wanted reimbursing for time and money spent using products that were clearly not fit for purpose. After the VOC 2010 fiasco many professional painters and decorators reluctantly switched to acrylic or hybrid paints and soon found water based replacements for their beloved oil paints. What a versatile bunch we are. Still now I hear decorators telling nostalgic tales of pre-VOC 2010 paints, how the world was a better place back then where paint did what it was meant to and that you could trust it to do the job. Myself being one of them. 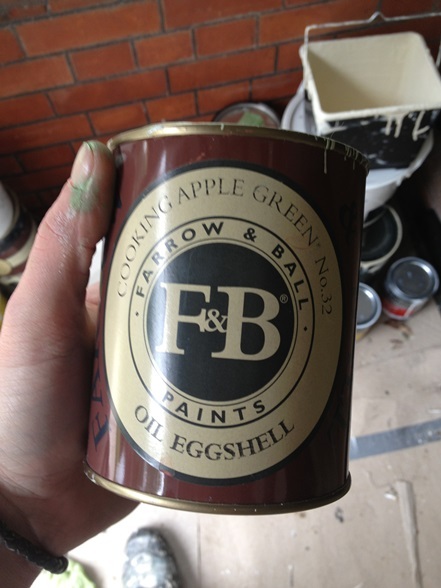 So when I stumbled across this litre of unopened Farrow and Ball Oil Eggshell in Cooking Apple Green I couldn’t believe my luck. I remembered this as a fantastic paint, with a beautiful low sheen finish that was a dream to use. I was half expecting it to jump out of the tin and apply itself perfectly to the door that I was intending to paint with it! F & B Oil Eggshell is no longer available. Farrow and Ball’s oil eggshell was discontinued after the VOC 2010 legislation and they switched to the water based equivalent which, although a quality product now, took some time to get right. I have heard of people having experiences of it not drying for several days and I have had experiences with very poor opacity myself. I half imagined that painting this door was going to be like stepping back into a much happier time! 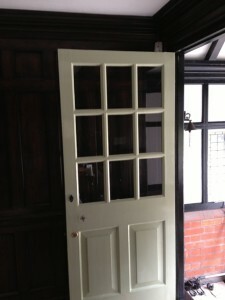 After thoroughly preparing the door a coat of Zinsser Coverstain was applied and left to dry. Then the first coat of Farrow and Ball was applied, which was a bit of a disappointment to be perfectly honest. It was very stiff and a good glug of Owatrol Oil paint conditioner was needed to loosen it up enough to be laid off properly. But this could have been because the paint had been left sitting for at least three and a half years, although it was properly stirred before use. Never mind… the first coat was touch dry in a couple of hours! So back to it the next day, all of the door; panels, glazing bars and beads were rubbed down with 320 grade wet and dry sandpaper, washed down and wiped over with a tack cloth. The second coat also benefited from Owatrol, it would have been almost impossible to tip off a flawless finish without it. The door was left overnight and the next day the process was repeated and the final coat applied which looked like this. 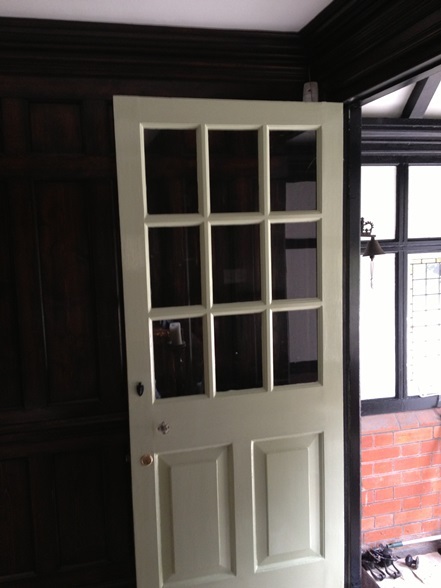 The door looked great and our customer was very pleased. 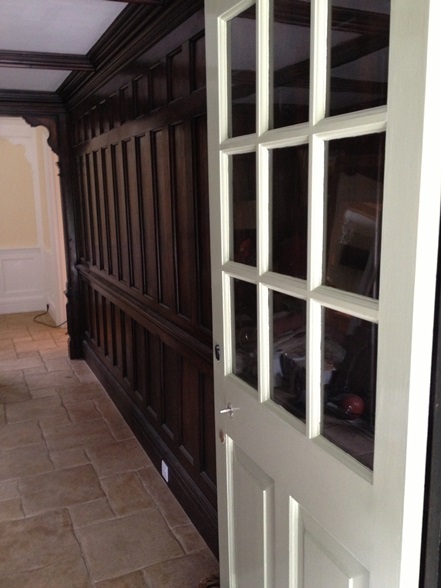 But how does the Farrow and Ball compare to VOC 2010 compliant oil eggshell? Well, as mentioned above this product is no longer available so I do not have a direct comparison. I can however compare it to a similar product that was used elsewhere on this project from Little Greene; Traditional Oil Eggshell. Both are ‘designer’ manufacturers who manufacture paints aimed at the high end of the market with a fantastic depth of colour and traditional finish. In terms of workability there wasn’t much in it, both laid off very well with the aid of some conditioner and a perfect finish is more than achievable with both. 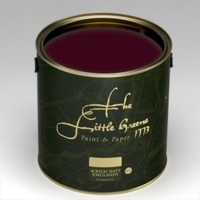 With regard to drying times Farrow and Ball had the edge, Little Greene is usually touch dry in around 3-4 hours whereas the no longer available Farrow and Ball was tack free in just over 2 hours. Also both rubbed down very well the following day, no major differences to report. In terms of finish, I personally preferred the lower sheen of the Little Greene eggshell! With regards to durability, I cannot comment just yet and will have to leave this to the test of time. Hopefully I can update at some point in the future when I have seen how the paint is performing. So my findings are fairly inconclusive really, but maybe it seems things weren’t all roses and sunshine as we remember them back then. 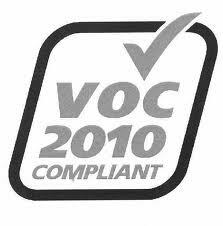 So what was all the VOC 2010 fuss about? Well things have moved on a bit since then, and although it is still a bitter talking point within the painting and decorating industry, manufacturers are now making products that are VOC 2010 compliant and just as good as, if not better, than they were back then. Some however, should still be avoided in my opinion. If you use white alkyd paint, such as gloss or eggshell, for an interior painting project with little or no natural light the finish will oxidise and turn yellow in a relatively short period of time. Acrylic is the only way to go for this situation. With most acrylic paints an extra coat is required, an adhesion primer, which ultimately means more cost due to extra materials and the extra labour time in applying said primer, but typically these paints are much faster to apply and it is quite possible that several coats can be applied in one day unlike traditional oil based paint. 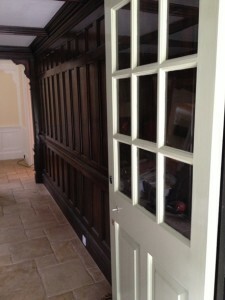 So although the costs are higher it is not a dramatic difference, plus your woodwork will stay white indefinitely. 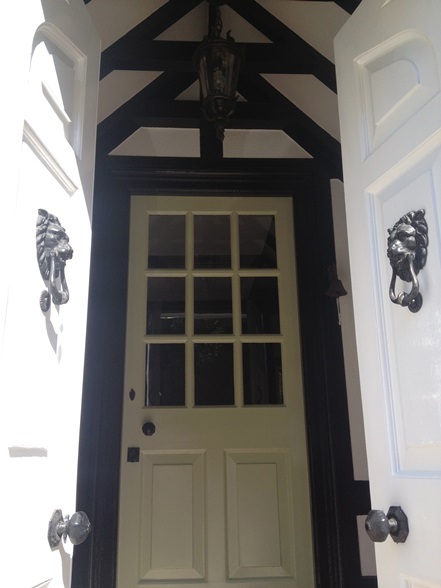 I have also almost entirely stopped using alkyd based paint for exterior work, there are much more durable and flexible solutions out there. In my opinion Bedec are leading the way in acrylic exterior paints, most are self-priming, highly flexible, breathable, look great and have excellent re-coat times. My only gripe is the limited colour range, custom colours can be mixed for around £12 but this makes it fairly uneconomical if only 5l are required. Nonetheless, they are making quality products and their products are what I recommend to most of our customers for exterior painting. If you have found this article interesting or informative you can subscribe to our blog here.